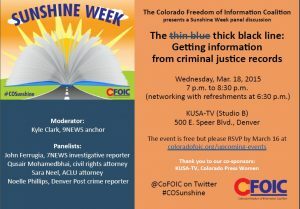 We are hon­ored to be part of this year’s Col­orado Free­dom of Infor­ma­tion Coalition’s (“CFOIC”) Sun­shine Week panel that is set for the evening of Wednes­day, March 18, 2015 in Stu­dio B at KUSA-TV, 500 E Speer Blvd. 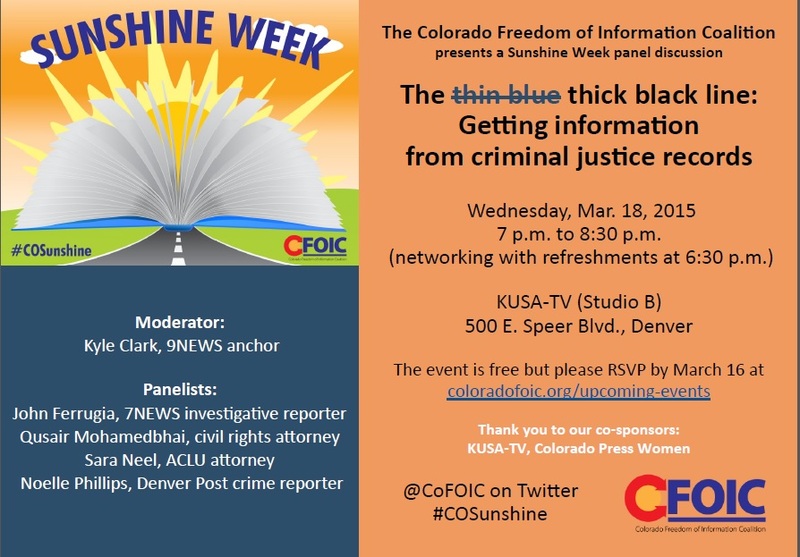 The topic is crim­i­nal jus­tice records and the line up is John Fer­ru­gia, 7NEWS inves­tiga­tive reporter; ACLU attor­ney Sara Neel; Den­ver Post reporter Noelle Phillips; and our own Qusair Mohamedb­hai. 9NEWS anchor Kyle Clark is mod­er­at­ing. CFOIC is hop­ing to add a law enforce­ment panelist. The event starts at 7 p.m. but net­work­ing with refresh­ments begins at 6:30.